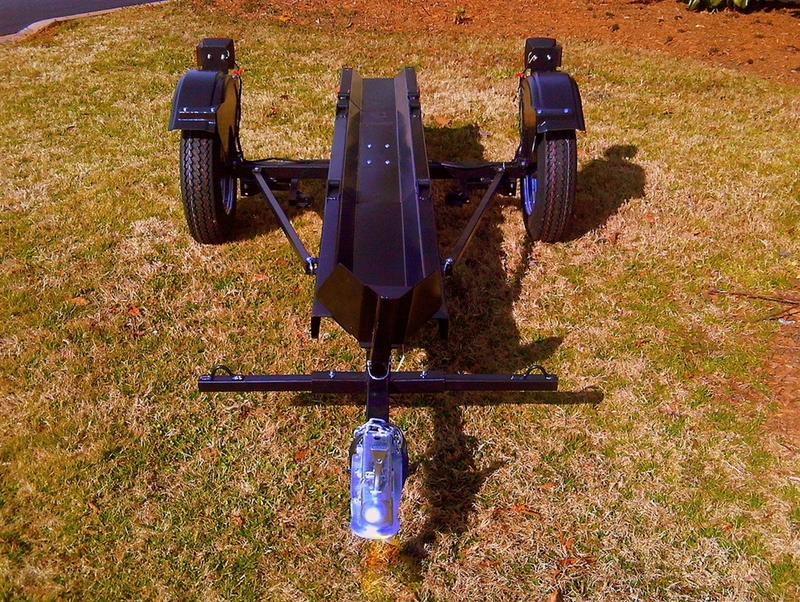 Coming out of Richmond, California, created and made by Rod Haskins is the Stinger, a rather cleaver yet simple folding motorcycle trailer. 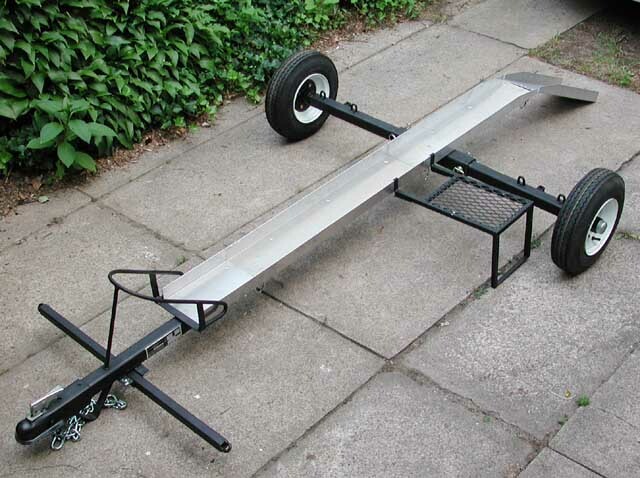 To be honest, this trailer is actually over-engineered, but in a way which benefits the user to a large extent. Much of the unit is made of high-grade steel which is powder coated for long-lasting durability. 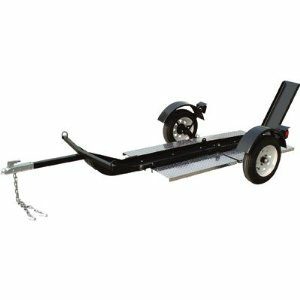 Where other trailers might have a bulky frame, the Stinger is simplistic and hooked directly to a heavy-duty 3500-pound axle which runs similarly durable submersible-grade (meaning from boat trailers) bearings. Those are connected to some rather smallish eight inch diameter wheels wearing six-ply tires which are rated for sustained speeds of 70 MPH. 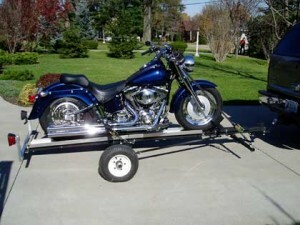 For holding the bike to the Stinger trailer, a high-strength Condor front wheel chock is standard equipment and there are four tie-down points. 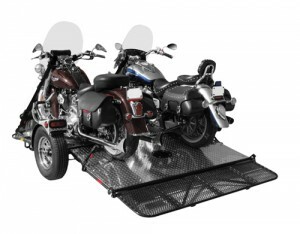 The loading ramp actually does double duty as a sort of tail-gate adding more stability to a mounted bike, not to mention making loading very easy. Fenders are included, and the taillights are protected by metal guards and appear durable enough to handle their duty worthily. 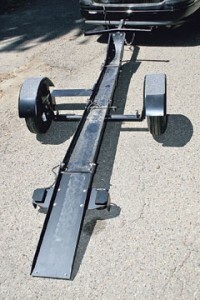 The hitch is specifically engineered to keep the trailer form flipping over in any way and is of standard type and size for most all applications. 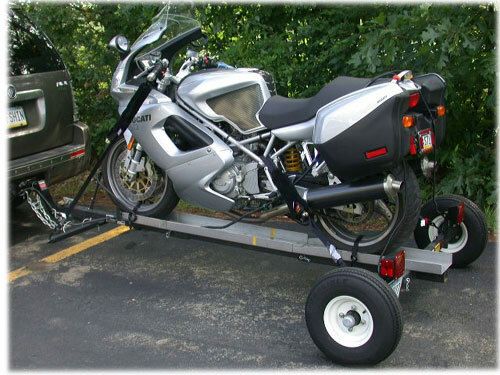 Overall width of the trailer, from wheel to wheel, is right at 48 inches and the unit, sans motorcycle, weighs in at 180 pounds. The Stinger can carry just about any production motorcycle with wheelbase up to around 80” or so, but it folds down to 48 by 30 by 30 inches square – not exactly tiny, but small enough to fit in the back of many minivans, SUVs, and certainly most garages. At first glance, the Stinger is very well-built – it looks tough as the steel it is made from. Each and every piece is solidly constructed and fit and finish are industrial-strength. Taking it from its storage mode to fully ready to haul is actually quiet smooth, though it can take some time to get used to the process. 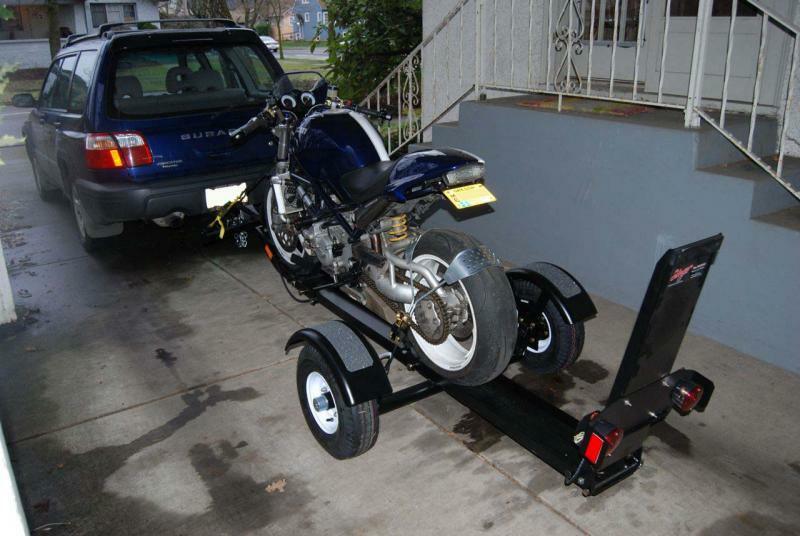 Loading a motorcycle is easy enough for one person, mostly due to its low stance, and there is a sidestand plate which can be mounted and a chock to hold the trailer level if it is not hooked up to a tow vehicle. When the Stinger is loaded up and under way, it is smooth and easy to control; it was very useful when hooked to a small car. One thing to consider, though, is that it is a short trailer and some larger vehicles may see it nearly disappear behind their tow vehicle – don’t forget it’s there! 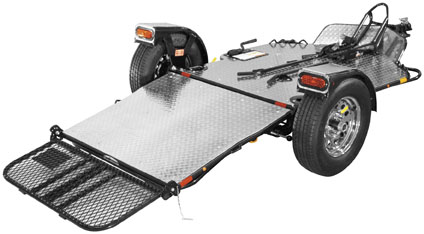 The Stinger folding motorcycle trailer is rugged, well-built, easy to use, and will work well with virtually any motorcycle you can own. It is worth considering when you need to haul your bike anywhere you need to be. There are times during the life of a motorcyclist when it is necessary to get a bike from one point to another without being able to actually ride it between them. Doing so often requires a pickup truck, van or, if you have neither of those, a trailer. Of course, when you bring a trailer along, you must also find some place to store the thing when you reach your destination. That can be a real hassle when arriving at a hotel near a crowded event, or simply when you get home and need to put everything away. For this job, something light and which stores in a rather small space is that which you seek. 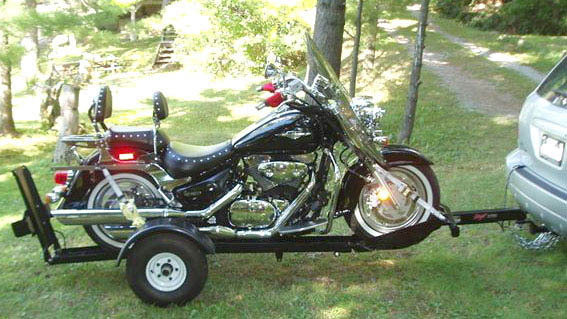 Start that search with a look at the Port-A-Chopper Motorcycle Transporter from QC Metal Fab, Inc.
Out of Elkhart, Indiana, QC produces the Port-A-Chopper out of lightweight and very strong aluminum with channels in the rails 6.5 inches wide, thus fitting a very wide array of motorcycle tires. 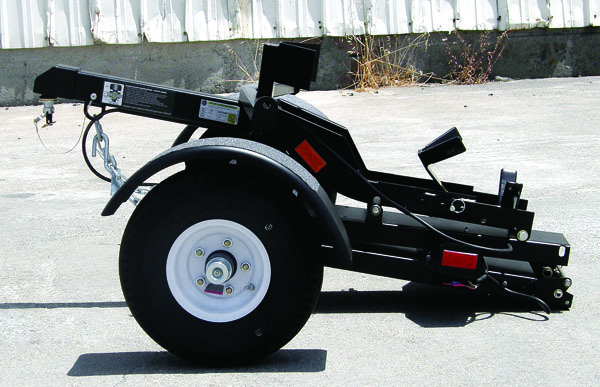 A smoother ride is provided by using a torsion axle suspension and hooking that into 8 inch high-speed trailer wheels and tires, which also feature six-ply construction. When hooking the Port-A-Chopper up to your tow vehicle, a handy adjustable wheel stop is standard which allows for 16 inches of adjustment to sort out the ideal tongue weight. 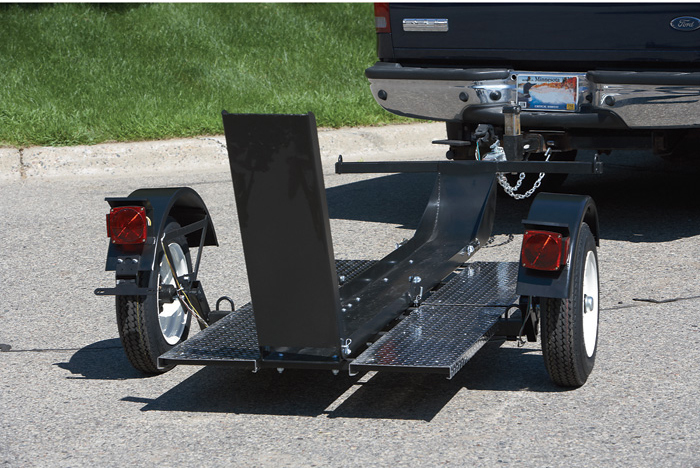 For easy loading of your bike when you only have yourself there to do so, a rugged, stainless-steel kickstand pad is located in the perfect spot on the trailer to hold up your bike while you hook up and adjust the tie-down straps. Now, to the important feature of the Port-A-Chopper; it can be assembled or disassembled in less than 15 minutes without the need for tools and by one person. 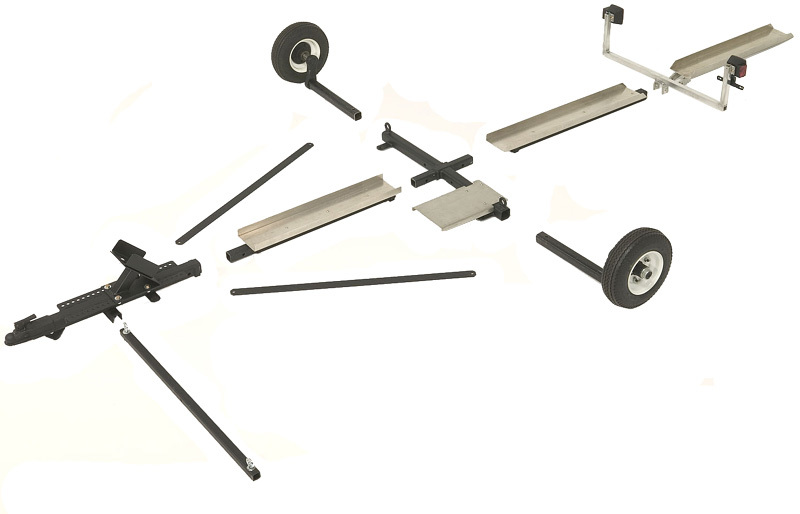 The process is made easy by the use of high-tensile bent hitch pins and simple, easy to understand instructions. And, none of the individual parts weight more than 44 pounds. Once taken down, the unit will easily fit in a standard car trunk or in the back of an SUV. Given that capability, imagine how easy it will be to store in a garage and you have a good idea why this design is so handy. What adds even more value to the Port-A-Chopper is how flexible it can be. 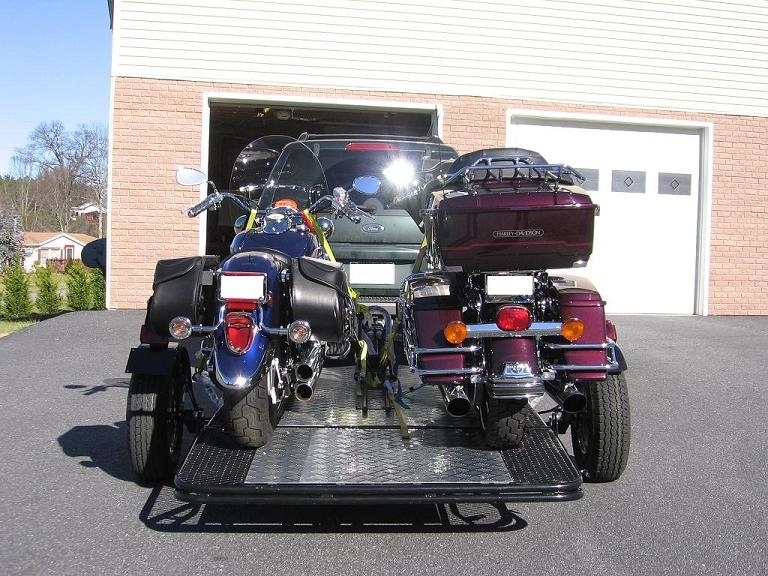 There are numerous upgrades which can be purchased through QC Metal Fab, including larger trailer wheels, fenders (as they are legally required in some states), two wider versions of the tire rail channels for larger motorcycle tires, tie-down straps and even spare trailer wheels. 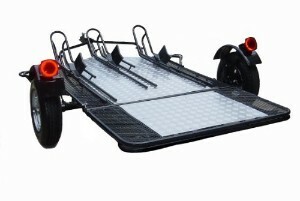 You can even convert it so that it will work as a transport for your personal watercraft or simply turn it into a utility trailer. 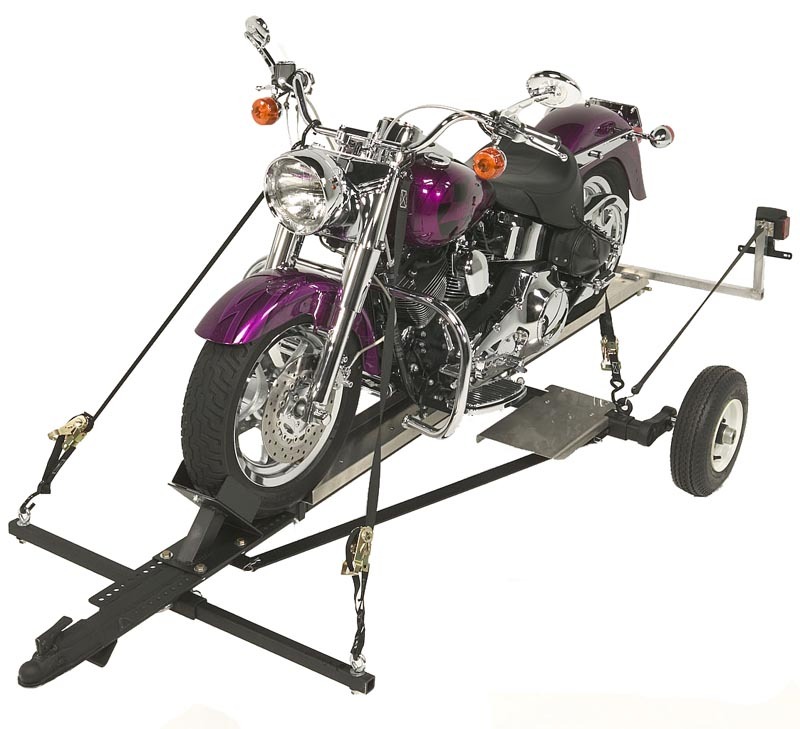 When looking for a trailer which can be used at a moment’s notice for that important trip to wherever the riding is phenomenal, the QC Port-A-Chopper is the perfect tool. 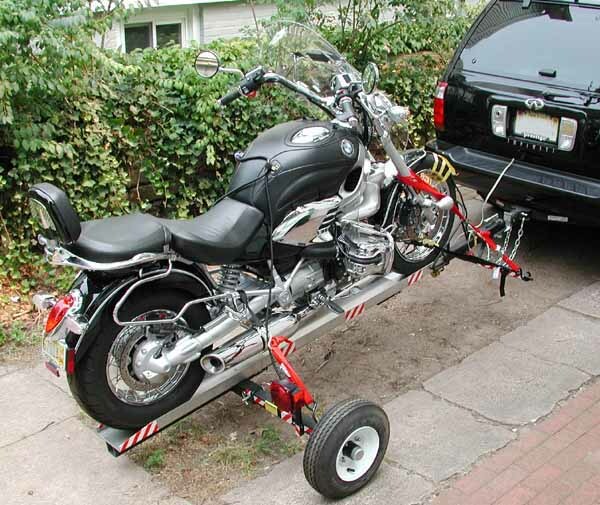 However, you could also use it for moving around a full-dress show bike. 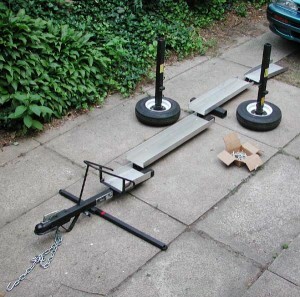 The total weight of the trailer itself is only a scant 275 pounds without options, but it can carry up to 925 pounds on its back in that form. 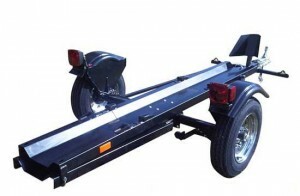 The basic, you-can-use-it-immediately Port-A-Chopper trailer version sells for US$1460 plus freight charges, with the additional options ranging in price from $39 to $405 depending on what you are buying (obviously). There are upgraded ‘packages’ which can save you some money and get you everything you need without much need for thought; this even includes a dual-rail version. The QC Metal Fab Port-A-Chopper is a wonderfully flexible tool for transporting your motorcycle wherever you need to take it.